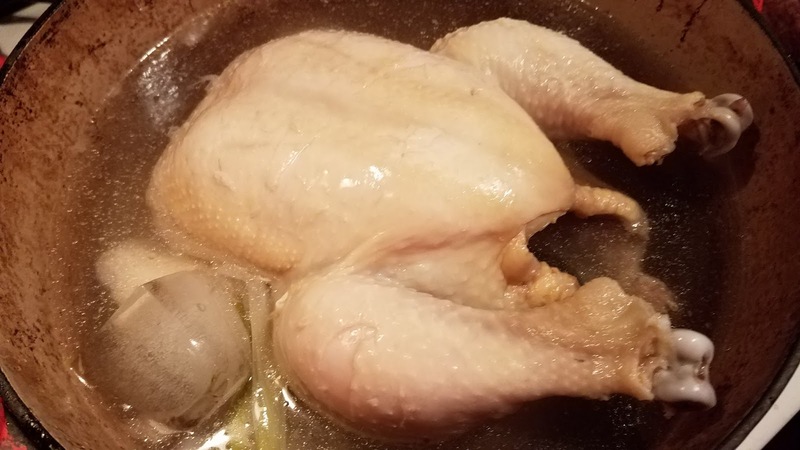 Yes, rotisserie chickens are easy to find and are getting better all the time, but they really can't compete with a home cooked chicken. 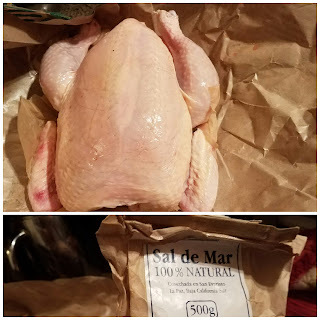 I've been experimenting with doing whole chickens at home, mostly butterflied and roasted, and researching the best ways to do it. From all the information I've gleaned, all the best recipes have one thing in common: salting the chicken 1-2 days in advance. If I haven't planned ahead, I'll usually go to Trader Joe's and get a Kosher chicken, which has been brined already. Ina Garten doesn't specify that in this recipe, but she waxes poetic about the late Judy Rodgers' version at Zuni Cafe, which even suggests salting it 2-3 days ahead. However, I'd also been in search of the perfect poached Cantonese chicken recipe since I worked up the Magic Ginger Scallion Sauce back in September. It serves about 4-6 people and takes an hour to an hour and a half, not including the day ahead salting. If you're intrigued but not quite convinced that a chicken without browned skin could taste good, believe me, it took a while for my eyes to adjust as well, However, this is the best technique for moist, tender, flavorful chicken, which makes up for the lack of yummy crispy skin. 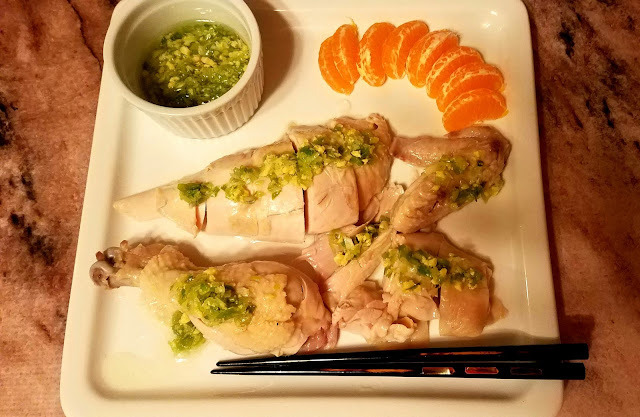 Every recipe I looked up and every person I talked to had a slightly different technique and timing, so eventually I just went with a combination of the two ladies most recently arrived from Guangdong I'd spoken with, a student of mine and a very sweet cashier at Whole Foods! Now, I say Cantonese Style because this is not entirely authentically Cantonese: I don't know when it was, let's just say processed, but I'm thinking it wasn't right before I brought it home. Also, the head and feet have been removed, so they wouldn't consider it whole. I still consider it whole enough to say thank you to it for feeding me. But back to it! 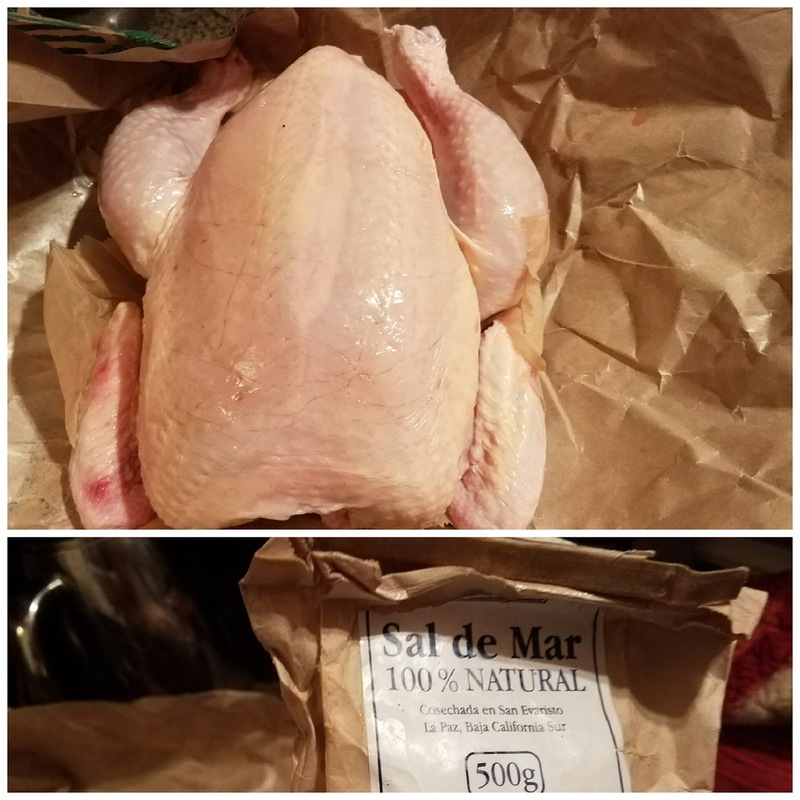 This is about a 4 lb chicken, the smallest I can usually find. I keep an eye out for sales, and got this from the butcher counter for just $1.69 a pound. Not organic, but from a good producer. One night ahead, remove the bag of bits from the inside. Save all but the liver to make chicken broth later (I keep a big Ziploc of scraps and stuff in the freezer until I have enough). 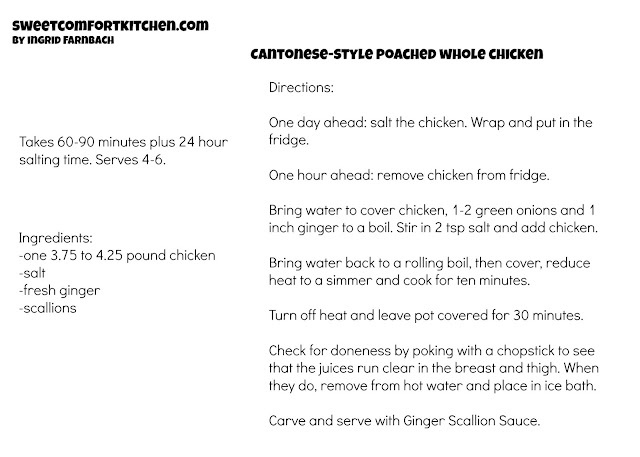 Pat the chicken dry and sprinkle it with salt, preferably Kosher salt or coarse sea salt. Use about 3/4 tsp per pound of chicken. If I were roasting, I'd use black pepper as well, but not for this. You'll notice I don't say to rinse it. Current thinking seems to be that rinsing just spreads any bad stuff around the kitchen, while boiling or roasting will kill it off anyway. Cover with plastic wrap and pop the chicken in the fridge. Take it out about an hour before you start. Put enough water in a stock pot to cover the chicken (you can put it in with the water to test or just add more water to cover if it isn't enough). 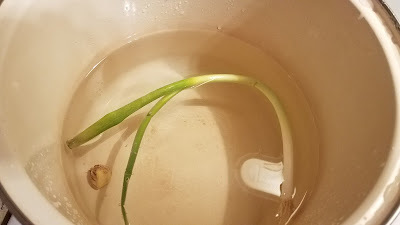 Add a green onion or two and a one inch piece of ginger. Bring the water to a boil. When it boils, add 2 tsp salt and the chicken. If you need to add more water, please do. I had to add a little here. 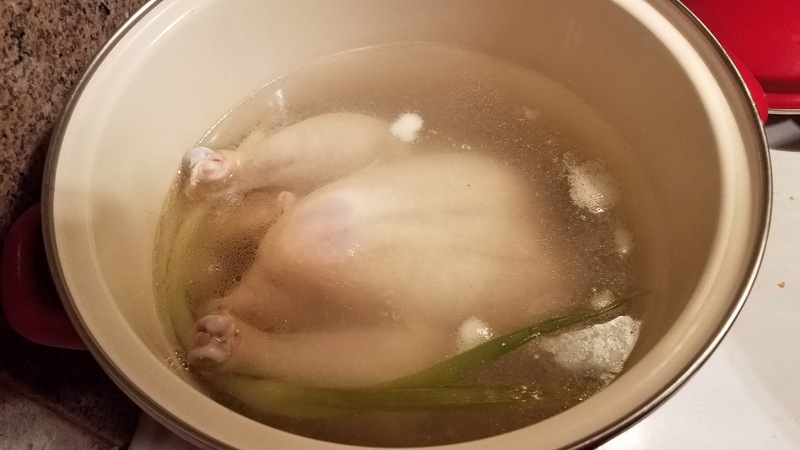 Bring the pot back up to a boil--this will take a few minutes because a big cool chicken cools down the water quite a bit. Once it comes back to a rolling boil, turn the heat down to a simmer, put the lid on and set the timer for 10 minutes. 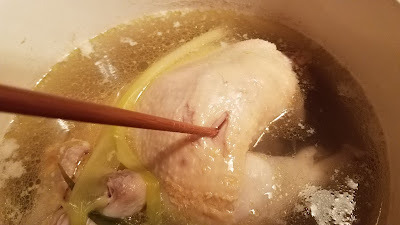 After the timer goes off, turn the heat off and set another timer for 30 minutes (this is for a four pound chicken, so put more time for bigger or less for smaller). 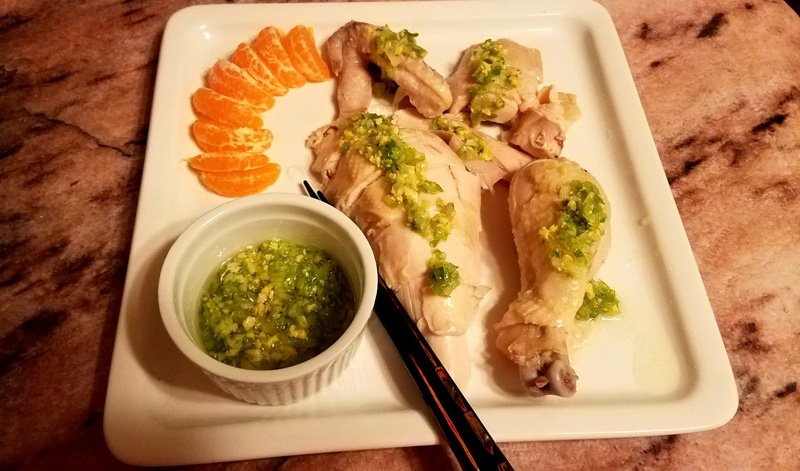 When it goes off, remove the lid and poke the chicken with a chopstick twice: in the breast and in the thick part of the base of the thigh. If the juices run clear, it's done! If they don't, it needs a little more time. If it's really red, you can bring it back up to a boil for another 5 minutes. Carve up (ideally bone in, but my carving skills are not that great) and serve with the above-mentioned ginger scallion sauce. For AHers: serve with soybeans or an orange for phase 1, or with brown rice for phase 2. Add a little steamed broccoli or bok choy. For non-AHers: serve over steamed jasmine rice.